This is the first report on the activity of 52 City of Design Partners in Detroit. 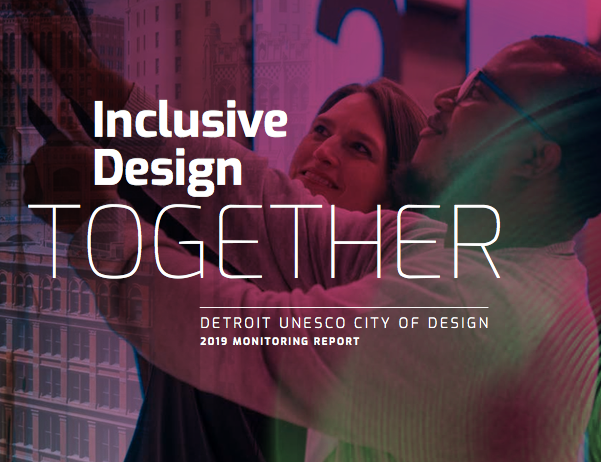 The “Inclusive Design Together: Detroit City of Design Monitoring Report” showcases the progress of 62 inclusive design projects across the city that touched 70,000 people in 2018. This will be the framework for the final report that will be submitted to the UNESCO team in November 2019. This report includes real stories that embody the hardworking culture of our community and the values of our initiative – diverse experiences, accessible opportunities, and collaborative relationships. It is to state that a partnership with Montréal was created to launch a Commerce Design program in Detroit; future relationships between all of UNESCO Cities of Design and local design communities are highly appreciated. With this report it is hoped to provide some inspiration for how to enable a wide range of people to have ownership and responsibility for the designation. For further information take a look at designcore.org.